Editor note: This post will be followed by Part II on additional technical documentation. Mr. Hawkins’s study is presented to increase the interest in this highly important, politically sensitive issue of incremental pollution from firming up industrial wind power. Integrating random, highly variable wind energy into an electricity system presents substantial problems that subvert wind technology’s ability to offset the use of fossil fuels–and avoid air emissions, including carbon dioxide (CO2). Measuring this accurately is important because many believe that wind projects significantly reduce such emissions. This analysis finds that natural gas used as wind back-up in place of baseload or intermediate gas (in the absence of wind) results in approximately the same gas burn and an increase in related emissions, including CO2. Extrapolating from this example to the whole, the working hypothesis is that intermittent wind (and solar) are not effective CO2 mitigation strategies because of inefficiencies introduced by fast-ramping (inefficient) operation of gas turbines for firming otherwise intermittent and thus non-usable power. In the absence of extensive real-time load dispatch analyses at finely grained time intervals capable of accurately and sufficiently assessing all the variables affecting electricity system behavior as wind energy penetration increases, I propose a method – a calculator – that captures a wide range of considerations. I am unaware of any previous attempt that is as inclusive as what I present here and welcome reader comments for improvements on the present framework or alternative approaches. The amount of wind mirroring/shadowing backup required. Inefficient operation imposed on the mirroring/shadowing backup, in terms of both the fossil fuel consumption and CO2 emissions, treated separately. Case B – The appropriate mix of gas plant type used to balance wind’s volatile output. This includes the need to introduce less efficient, but faster-reacting, Open Cycle Gas Turbine gas plants (OCGT) to mirror/shadow the wind production, especially as wind penetration increases. The effect of reduced wind capacity factor. The effect of wind output exceeding 1-2 percentage points of a total electricity system, on a country or regional basis. The framework used is similar to that of Warren Katzenstein and Jay Apt (see citations below). It focuses on the wind/gas plant combination and has general applicability. Additional considerations involving wind’s impact on other electricity system elements particular to a specific jurisdiction, such as baseload capacity as analyzed by Campbell, will have to be assessed separately and could have implications that further offset wind’s claimed benefits. 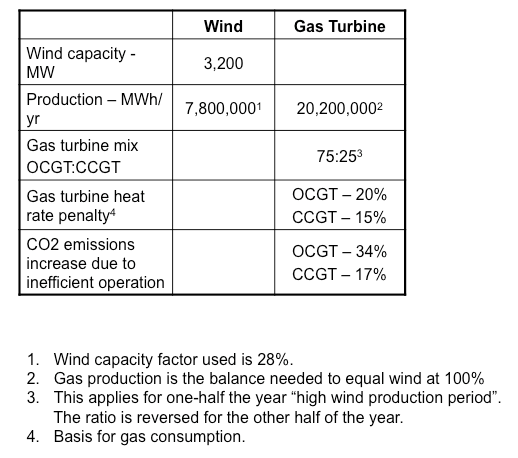 Table 1 provides basic information on the wind and gas plants for the results contained in Figures 1 and 2. Figure 1 below displays the calculator results for fossil fuel savings. The “Typical Claim Scenario”, which ignores the heat rate penalties, shows over 50,000 MMcf/yr savings assuming CCGT plants only. In this case, introducing OCGT, again without heat rate penalties, reduces the savings to about 30,000 MMcf/yr. Introducing heat rate penalties and using CCGT only produces savings of about 30,000 MMcf/yr as well, but the inclusion of OCGT plants reduces gas savings to almost zero. Figure 2 displays the results for CO2 emissions savings. The “Typical Claim Scenario” shows annual savings of about 3 million tons of CO2 ignoring any OCGT considerations and any effect of heat rate penalties or the related CO2 emissions increase factor. Introducing OCGT within this scenario cuts the savings by more than one-half. Using the inefficiency factors and only CCGT shows that the CO2 savings are reduced by about one-third, but introducing OCGT drives the CO2 savings into the negative category. Notwithstanding the nature of the calculator, robust inferences can be drawn from its results because the analysis captures a fuller range of considerations. The general conclusion is clear: industrial wind power does not produce the claimed benefits of reductions in fossil fuel consumption and CO2 emissions when up-and-down backup generation inefficiencies are taken into account. To answer questions about the effect of varying some of the input parameters used, further analyses have been developed. In particular, the effects of varying the OCGT:CCGT mix in high wind production periods and the heat rate penalties and related CO2 emissions increase factors are analyzed. Also, as the calculator divides the wind year into high and low wind production periods, the effect of varying the skewing of wind production between these two periods is also presented. The first shows the effect of varying the OCGT:CCGT mix for the wind high production period. The 25:75 ratio for OCGT:CCGT gas plants for low wind production periods is held constant for all cases shown. All other parameters are held constant. Figure 1 shows the results for gas savings and a range of capacity factors. Negative values represent increased gas consumption. Reducing the OCGT component to 25 per cent at a 28 per cent wind capacity factor still produces only about 25 per cent of the simplistic, Typical Claim scenario reductions. Figure 2 shows the results for CO2 emissions savings. Again negative values represent increased emissions over CCGT plants operating alone. Reducing the OCGT component to 25 per cent at a 28 per cent wind capacity factor yields effectively zero CO2 emissions savings. The lower ranges for OCGT plants in the mix are likely not feasible. Some may argue that the heat rate penalties in the examples shown above are either too high or too low. Figure 3 and Figure 4 show the effects for the values used, plus or minus 5 percentage points for CCGT plants. This produces a range from 10 to 20 per cent for CCGT plants and 14 to 27 per cent for OCGT, with corresponding CO2 emissions increase factors. Other parameters are held constant at the values used for the 15 per cent (CCGT) and 20 per cent (OCGT) heat rate penalties calculator runs. The “x” axis is in CCGT terms. Values below 10 per cent for CCGT plants will increasingly support wind proponent estimates. Values above 20 per cent may be viewed by others as more applicable. The calculator assumes that a year can be divided into high and low wind production periods, and allows for the variation of this by input parameter. A ratio of 50:50 was used. Further, the amount of the skewing of wind production between the two periods can be altered. For the calculator runs shown, the skewing is assumed to be the annual average plus and minus 50 percent. This sensitivity analysis shows the effect of varying the amount of the skewing from 20 to 50 per cent. Figure 5 is the result for gas savings by varying this percentage from 20-50 per cent. Figure 6 shows the effect on CO2 emissions savings. In general, the effect of reducing the range of variation between the low and high wind production periods is to reduce savings. This is caused by a decrease in wind production in high wind periods, resulting in increased gas plant production, especially OCGT. So the use of 50 per cent is more beneficial to wind. The effect of these sensitivity analyses is to support the above conclusions. E.ON Netz, Wind Report 2004. This no longer seems to be available online. Katzenstein W. and Apt J, Incorporating Wind into a Natural-gas Turbine Baseload Power System Increases NOx and Co2 Emissions from the Gas Turbines, 2008, Carnegie Mellon University, http://www.ece.cmu.edu/~electriconf/2008/PDFs/6-2%20Katzenstein%20and%20Apt.pdf. Katzenstein, W., and Apt, J., Air Emissions Due to Wind and Solar Power, 2009, Environmental Science and Technology, VOL. 43, NO. 2, 2009, page 253, http://pubs.acs.org/doi/abs/10.1021/es801437t. Kent Hawkins, a retired electrical engineer living in Ontario, has spent the last eight years researching the integration of industrial-scale wind plants into electricity systems. He can be reached at kenth@kos.net. This entry was posted in Subsidies / Costs, Viability and tagged Energy viability, environment by wind resist. Bookmark the permalink. According to Dalton McGuinty, the reason we have to build these wind farms is to shut down the coal plants with their nasty fossil fuel emissions. Now, we already know that wind turbines will never close down a coal plant, and it seems that they do not even lower carbon emissions due to the natural gas backup generation. So folks, it seems our energy supply for the future has been built upon a false premise. We, as an electorate, entrusted Dalton McGuinty with the grocery money, and he spent it all on pop and Twinkies instead of meat and potatoes. To all the people with stomachaches, he says,’ Nonsense, it’s all in your heads, Now let’s have another helping.” However, the cases of indigestion are increasing rapidly, and there soon will not be enough antacid available to quell the rising nausea. How many OCGTs are currently operating in Ontario? How much Hydro Electric Power is currently used to balance the wind shortfalls? If answers to the above are factored into the article, then it will be accurate, without compromising the intent too much. wonder what the ieee would think of this analysis? have you considered submitting to IEEE-PES? @ Dave: for some of the information, go to the IESO Reports as it provides a listing of the generators currently in Ontario. I don’t know how many more OCGT’s McGuinty plans on building but the list certainly has grown since last time I checked! Thanks for your reponse. Not many (any?) of the gas fired plants listed are OCGT – most (All?) are either CCGT or CHP. They are planning to build an OCGT plant (the first?) in North York, ready for 2011/12. My suggestion is that you refactor this information into your analysis to ensure its correctness. I’ll leave the passage of time to self-document this process. The post-Smitherman period will be an interesting chapter. Hydro dams will not work too well with the variability and unreliability of industrial wind developments for many technical reasons, but there are some obvious ones. Low flow periods happens seasonally in the winter and sometime throughout a year or years which means electricity production from a hydro dam is limited during those times. Even when water is available jacking flows up and down to shadow industrial wind would have major environmental and safety impacts on a river system. Holding back water is not an option on many hydro dams in part to flooding and in part to dam elevations. Spilling water is considered a waste as no electricity is produced by the dam. No gains if spillage occurs to incorporate industrial wind. No power available in low precipitation periods. If hydro dams were used, what will be their backup? Good work Kent.